2016 Hall of Fame Weekend Oct. 14-15-16 Will Be Bigger and Better! 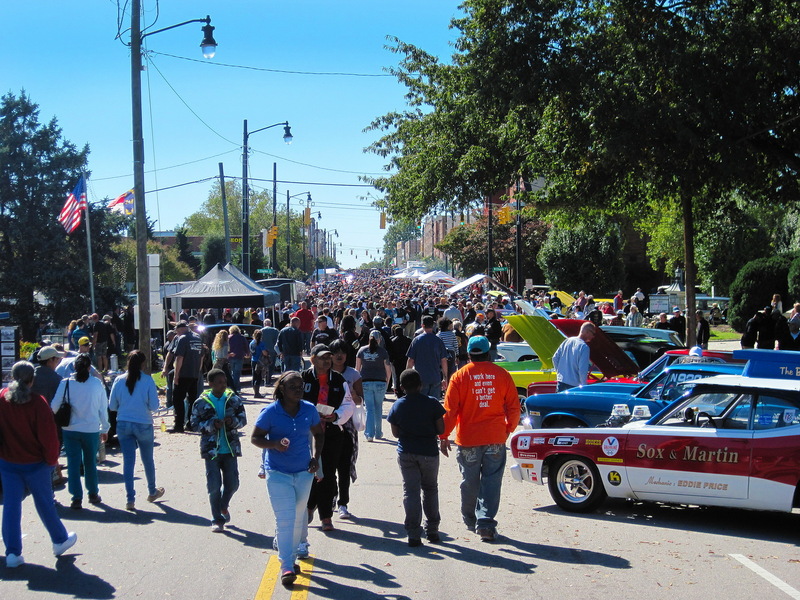 More than 30,000 car enthusiasts jammed the one-mile stretch of downtown Henderson, NC for the 2015 East Coast Drag Times Hall of Fame Saturday car show. In 2015 the show drew over 1,500 entries ranging from famous drag race cars to street rods, musclecars, restored antiques, and trucks. If you love cars, especially drag race cars, musclecars, and street rods, enjoy talking to their owners and drivers, and live anywhere on the East Coast of the U.S., the weekend of October 14, 15 and 16, 2016 really is a “must do”. That’s because the 15th Annual East Coast Drag Times Hall of Fame Weekend will once again be held in its home, Henderson, NC! It’s hard to believe that an informal, 2001 backyard barbeque gathering of East Coast racers would have evolved into one of the East Coast’s premier events for drag racing and performance car enthusiasts. Even more astounding is that the 2015 event drew more than 1,500 entries for its car show, and attracted more than 30,000 spectators! And the 15th Annual Hall of Fame event, October. 14-15-16, 2016, is expected to bring in even more cars and spectators! On Sunday, October 16, 2016, the East Coast Drag Times Hall of Fame will induct a new class of drag racing heroes at Vance-Granville College. Inductees include figures from all aspects of drag racing chosen by the HOF Selection Committee. Here are the 2015 HOF inductees after receiving their commemorative plaques. Back in 2001, Henderson, NC native Nancy Wilson contacted fellow racers and former racers and invited them to her home for a backyard barbeque afternoon. She also urged them to invite their own racer pals to attend. Nancy was herself a regular competitor on North Carolina, South Carolina and Virginia tracks. “When Charles my husband and I hosted the barbeque for the first time we drew a surprisingly large crowd. Everyone had a nice time reuniting with fellow racers and talked about getting together yearly. I thought about the event for months and decided I could organize an event for honoring drag racers and recognizing their accomplishments and contributions to the sport. I presented the concept to the Vance County Tourism Development Authority, and they agreed with me. The Henderson City Council and NC DOT gave us permission to use Historic Downtown Henderson and close Garnett Street (main street), US Hwy 1, as the site for the initial East Coast Drag Times Hall of Fame. We named our original Hall of Fame group and set our now traditional mid-October dates for our first event. None of us who were initially involved thought we would now be planning our 15th annual event, or that it would grow into one of the largest of its type on the East Coast. We are equally amazed that our Hall of Fame members would come to include so many icons of the drag racing world”, noted Nancy Wilson. As the Executive Director for the Vance County (NC) Tourism Development Authority, Nancy wanted to create a Hall of Fame for those notables whose racing careers occurred “back East”. These individuals were generally out of the spotlight of the mainly California-based drag racing media. Since then the Hall of Fame has expanded its scope to include inductees from the Midwest, Southwest and even some deserving drag racing heroes from California. Nancy Wilson’s vision and dedication plus the enthusiasm and hard work of many former racers and volunteers have brought the event to its currently amazing state. “We’ve been very fortunate and blessed with the help we’ve received in making this event grow to its present size. 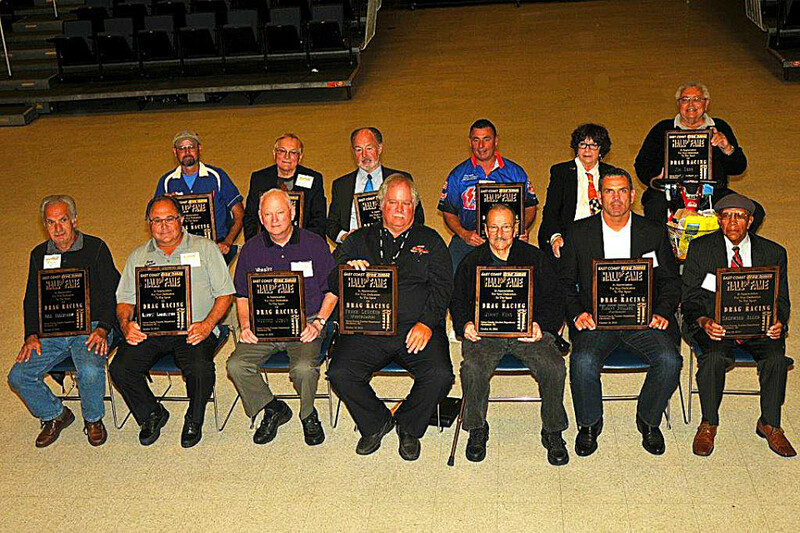 Best of all, we have been able to create a lasting legacy and memory for all these great drag racing heroes of the past. Along the way, we’ve been able to honor not only the top-level professional racers, but the regional little-guy Sportsman racers who have always been the backbone of the sport”. “I can look back now and see how this was something that was badly needed, and one that really deserves to continue to grow in future years”, added Ms. Wilson. The steady growth of the event underlines its validity. Even during those years of a depressed national economy, $4.00+ per gallon gasoline and high national unemployment, the Hall of Fame Weekend showed surprising growth. 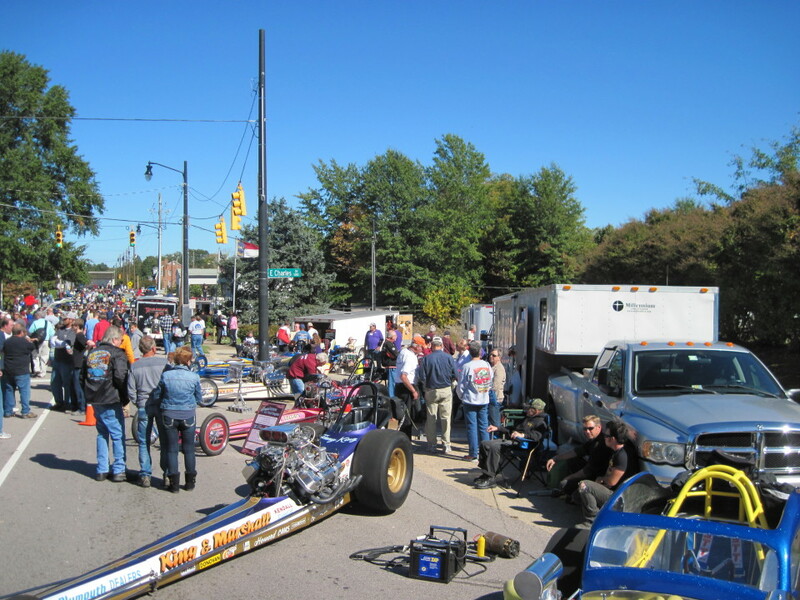 That alone bears witness to its strength as an affordable, enjoyable event that attracts car and drag racing enthusiasts and their entire families to Henderson. “I can’t begin to say enough about the City of Henderson, North Carolina and its residents, and those of Vance County, for their enormous support and encouragement for our Hall of Fame Weekend. Henderson literally allows us to occupy the entire downtown area, its main street and all its side streets to park the car show entries and street vendors we attract. We are especially appreciative of the Henderson merchants who support the event by accommodating the thousands of spectators who roam the entire Henderson business district all day on Saturday. The Hall of Fame Car Show Saturday has become a true community event and we are all thankful for the support”, Ms. Wilson reflected. Above: This ’55 Ford has all the right 50’s hot rod stuff. Under the hood are “Three Deuces”, a three two-barrel carb set-up, aftermarket mag-style wheels and a bright red and white paint scheme. This and hundreds of similar examples will once again be on hand Oct. 14, 15 and 16, 2016, in Henderson, NC. Perhaps the single most important factor in the tremendous growth of the spectator attendance for the Hall of Fame Car Show Saturday is that the entire show is an open-air event, with absolutely free admission! Car Show entries are charged a nominal $25 fee per car judged, covering the very generous number of awards presented. Another key attraction is the wide variety of cars displayed in its 1976-and-older format. This allows a great breadth of enthusiast vehicles to participate. These include the popular classic musclecars that came of age in the 1960’s, creating a cultural revolution in a generation of enthusiasts. This American demographic is now known as “The Baby Boomers”, and represented by popular “Car Culture” songs such as: “Hot Rod Lincoln”; “Little GTO”; “She’s Real Fine, My 409”; “Deadman’s Curve”; “Drag City”; “Mustang Sally”; “Little ‘Ol Lady From Pasadena”; and the classic Beach Boys, “Little Deuce Coupe”. These and other songs are played by a live DJ during the Saturday activities. 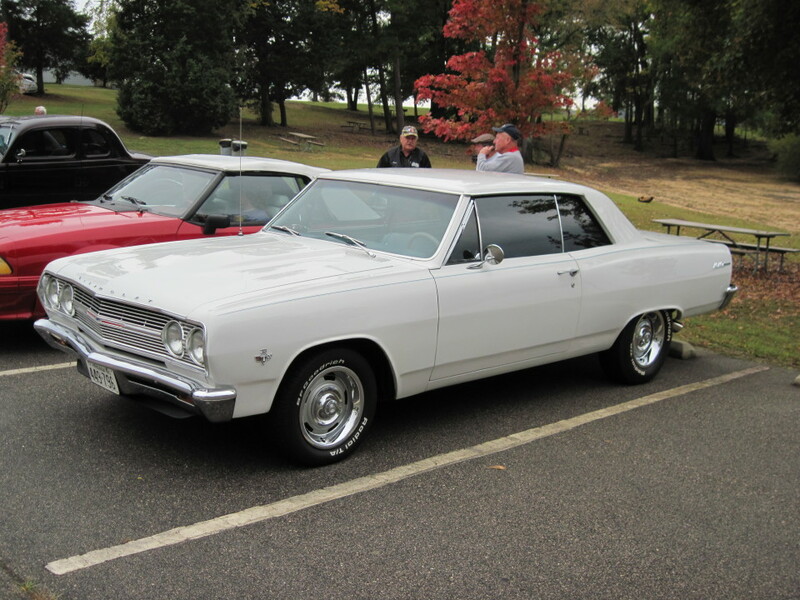 Above: This pristine, white ’65 Chevelle made the short drive from Virginia to attend the 2015 East Coast Drag Times Hall of Fame Weekend. The Malibu is powered by a 350 hp, 327 small-block V-8 with a four-speed transmission and Chevy Rallye Wheels. This restored musclecar is typical of cars expected for the 15th Annual Hall of Fame Weekend, Oct 14-15 and 16, 2016. Street rod enthusiasts, especially those of pre-WW-II vintage are also well represented with classic coupes, roadsters and sedans, chopped, channeled and hot rodded to the specifications that define a street rod. Above: Street Rods are a big part of the annual East Coast Drag Times Hall of Fame event. 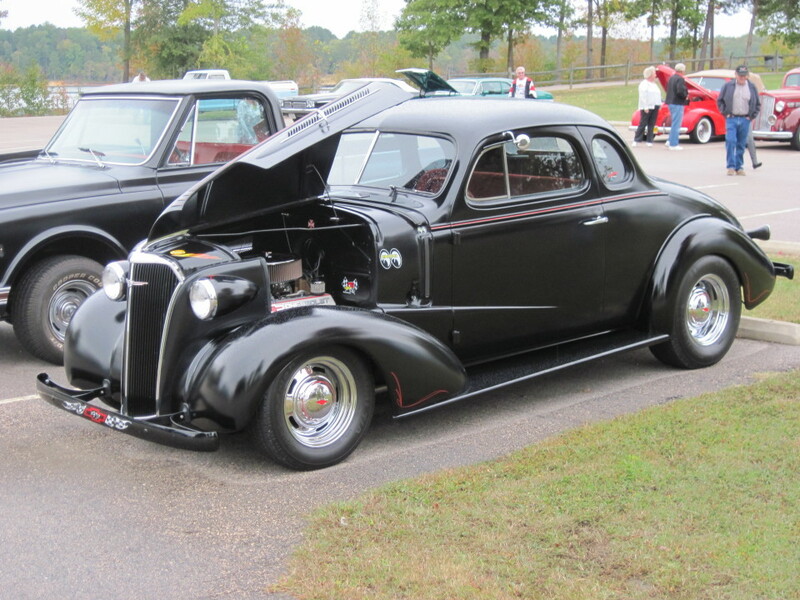 This ’37 Chevy has all the classic stuff including a Chevy V-8 for power, automatic transmission, front disc brakes, comfortable bench seats and of course, aftermarket wheels and radial tires. Yes! Vintage restored antique vehicles are also included and popular with running, driving antique cars and even trucks represented. Included are Ford Model-T, Model-A and Model-B vehicles from the 20’s and 30’s plus the “Fat Fender” classics of the immediate pre-WW-I and post-War era. 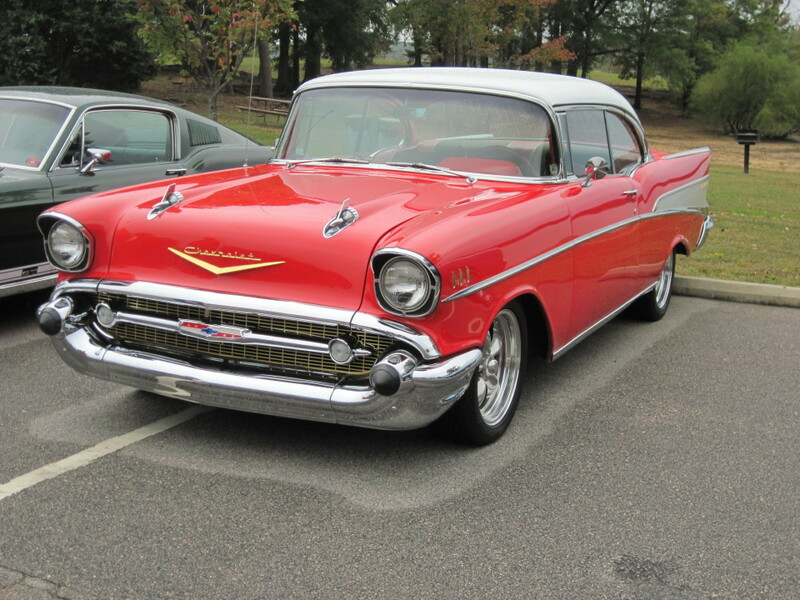 Above: What would a car show be without a bright red ’57 Chevy Bel-Air? This “Resto-Rod” has late-model V-8 power and power-disc brakes but looks largely as it did in 1957! Tri-Five Chevys are well represented at the East Coast Drag Times Hall of Fame Show & Shine. A large 55-57 contingent is expected for 2016. A special display included every year is the Henderson, NC-based Corbitt Preservation Association and its large showing of Corbitt Trucks. The firm’s manufacturing and management was headquartered in Henderson, beginning in 1899, when Richard J. Corbitt began building horse buggies. By 1913 he gave up on buggies and motorized cars and built only trucks. Corbitt is credited with many engineering breakthroughs. They provided the military with thousands of heavy trucks for the armed forces in World War I and WW-II. Corbitt was a major participant in President Franklin D. Roosevelt’s WW-II “Arsenal of Democracy” that helped win the conflict of WW-II. 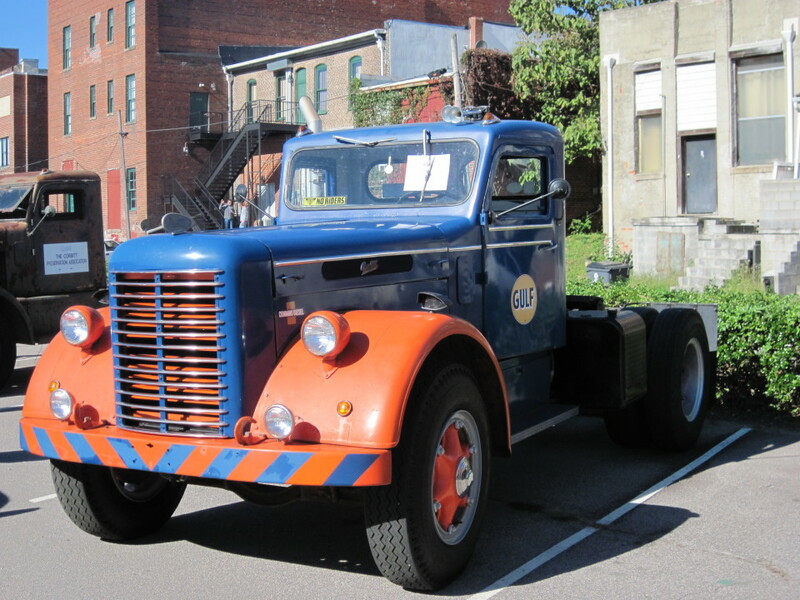 Above: The Corbitt Preservation Association brings out a large number of their members’ trucks. Corbitt was a major supplier of military trucks in both WW-I and WW-II as well as freight and utility trucks. 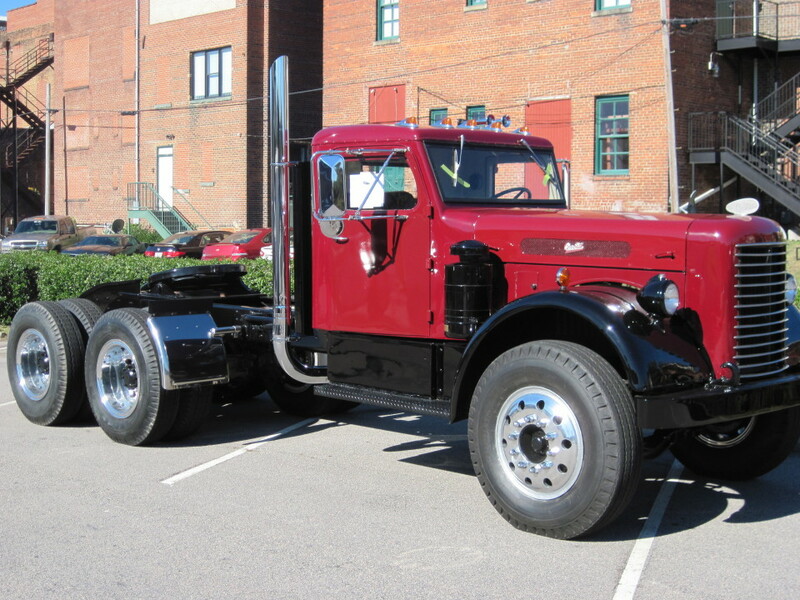 The company began building heavy trucks in Henderson, NC, in 1913 and continued until the company closed in 1955. The Corbitt club each year brings out their impressive array of restored, running and functioning Corbitt trucks as well as “works in progress” restoration projects. Since “car nuts” love anything with wheels, the Corbitt display is one of the most visited at the Saturday car show. Abve: This tandem-axle, Cummins diesel powered Corbitt freight hauler looks ready to hook-up to its semi-trailer and hit the road. Corbitt offered advanced engineering and rugged construction. Corbitt trucks used ring-and-pinion differentials instead of chain-drive as early as 1916! One Corbitt dump truck recorded over 2.5 million road miles! If you prefer classic drag race cars, the East Coast Drag Times Hall of Fame provides one of the East Coast’s largest exhibitions of race cars. Included are 200 mph, ground-shaking Top Fuel Dragsters and Nitro Funny Cars, Gassers, Altereds, Super Stocks and even famous Pro Stock legends. Along with each car is its owner, and often the driver who wheeled the car to its Hall of Fame eligibility. Are these legends eager to talk about their race cars? You bet! Above: At 1:00 pm all the race cars stage a static “Cackle Fest” firing up their open-header engines to the delight of the crowd. This includes Top Fuel Dragsters and Funny Cars with their ground shaking, supercharged Hemi race engines. The fans flock to take in the noise and fumes. On Sunday, October 16, a group of these carefully nominated East Coast Drag Times Hall of Fame inductees will be honored for their career achievements in drag racing. On hand will be their families, fans and friends to observe. That same morning is a full two hours devoted to time spent with drivers and crew members who have their own great collections of memorabilia, photos and scrap books. These heroes are also available for “bench-race” chatting and autograph signing along with posing for photographs upon request. Once again the Hall of Fame induction ceremonies will be conducted by TV personality Bret Kepner. Bret has been a featured presenter on ESPN, Speed channel and has hosted several different cable network shows covering drag racing. Kepner is himself a 2007 Hall of Fame inductee, and an on-air personality known to drag racing fans nationwide for his in-depth knowledge of the sport and its history. His keen insight into each of the Hall of Fame inductees’ racing careers make his presentation ceremony a thoroughly educational as well as entertaining experience. Above: Classic automotive art is common during the East Coast Drag Times Hall of Fame car show. 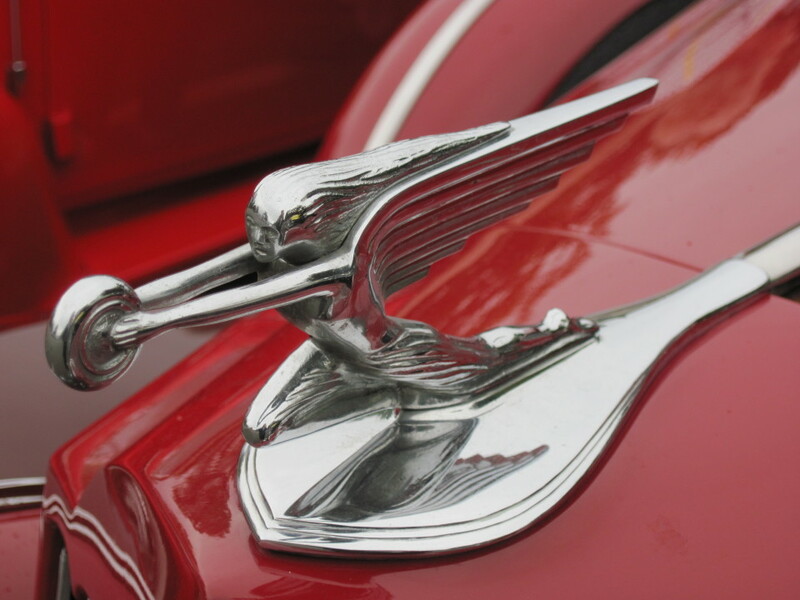 This graceful ornament sits proudly atop the hood of a 1938 Packard street rod sedan. 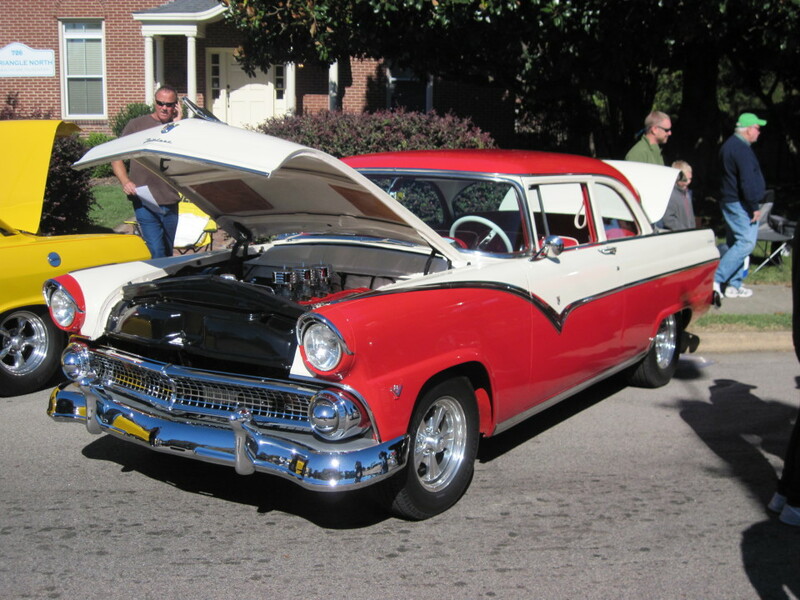 Other examples of the car hobby can be seen at the 2016 event, October 14, 15 and 16, in Henderson, NC. The Hall of Fame Weekend is a wonderfully low-stress, low-impact three days spent in the historic Henderson, NC area and happens during the season’s finest time of year. Fall’s comfortable temperatures and the abundant sunshine of Indian Summer come together for a weekend of relaxation and enjoyment. For drag racing fans, land has been purchased and preliminary plans made to eventually construct a permanent home for the East Coast Drag Times Hall of Fame, and a museum that will display examples of those famed race cars driven by the Hall of Fame’s members. The museum is currently undergoing fund raising activities and eagerly awaiting the day when that first shovel of dirt heralds the beginning of its construction. Henderson, NC and the 2016 Hall of Fame Weekend is conveniently and strategically located off three I-85 exits, 40 minutes north of Raleigh, NC, and less than an hour south of the key I-85/I-95 interchange. There are numerous motels, restaurants and shops available. If you’ve not yet enjoyed this great weekend plan now to attend! For more information contact: Vance County Tourism Development Authority; Henderson, NC; (252) 438-2222; (866) 438-4565; www.eastcoastdragtimeshalloffame.com, or e-mail: vctourism@gloryroad.net.